I read this article in the New York Times Dining & Wine section (can you tell it's a favorite?) and had to share. 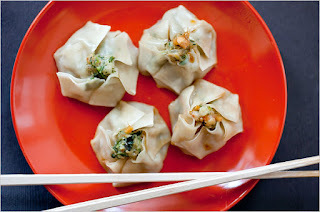 I love Shu Mai and these just sound so fantastic. I can't wait to try them myself. Steamed Chinese-style dumplings — often called shu mai, although there are many other types — are a real treat. Sadly, though, when served in restaurants they are often disappointing, with too-dense filling, not much flavor and a wrapper that’s chewy rather than tender. For the most part, the best shu mai are made from scratch, at home. Though they can require a lot of skill, if you focus on quality rather than appearance they will taste better than any you’ve eaten. Having said that, I’ll admit mine are a bit rustic in appearance. I use a filling of shrimp and a lot of seasoning, including a big handful of cilantro and a fair amount of scallions. I purée half the shrimp and cilantro with the scallions and then roughly chop the remaining half by hand, then I meld everything with a soy-based seasoning sauce. The process ensures that there’s enough “glue” to hold the mixture together, without turning everything to a thick, dense paste. I end up with nice chunks of shrimp with enough air to keep everything light. Ta-dah! I don’t have the patience (or skill) for pleating, so I lightly dampen the outer edge of the (store-bought) wrapper, spoon in a little filling, then pinch the wrapper closed in four corners, leaving a bit of the filling showing through the top. A few minutes’ of steaming makes the wrappers tender and the filling pink and opaque. With some fresh lime juice added to the remaining soy seasoning mixture, you have a bright dipping sauce. Grab your chopsticks." 1. Combine the soy sauce, rice wine, sesame oil and ginger in a bowl. Put half the shrimp, half the cilantro and all the scallions in a food processor and pulse; add just enough of the soy mixture to create a smooth paste, about 1 to 2 tablespoons. Transfer to a bowl. Roughly chop the remaining shrimp and cilantro, add them to the bowl and stir to combine. 2. 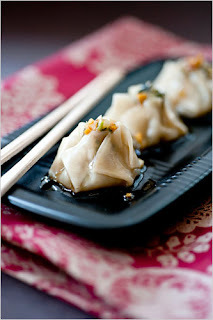 Place a dumpling skin on a work surface, moisten the edges with water, and put 1 teaspoon of the filling in the center. Gather the edges of the wrapper up around the filling, squeezing gently, to pleat the sides; some of the filling should remain exposed. Repeat with the remaining dumpling skins and filling, keeping the dumpling wrappers and dumplings covered with damp towels while you work. 3. Rig a steamer in a large pot over an inch of water; bring to a boil and reduce to a simmer. Meanwhile, add the lime juice to the remaining soy mixture to make a dipping sauce. 4. Put as many dumplings in the steamer as you can fit in a single layer and cover the pot. Cook until the exposed filling turns pink and the wrappers are tender, 4 to 6 minutes, then transfer the dumplings to a serving platter. Repeat with the remaining dumplings. Serve with the dipping sauce. Yield: 10 to 12 dumplings. I am SO making these too!! Just need the find the wrappers. I made these this past weekend and delicious! Only thing I did was use a metal steamer, that you put in the bottom of the pan, and sprayed a little with Pam spray - as the first lot, I found - some of them stuck to the bottom. With the pam spray they were easy to lift. Latkes and Babkas and Sauerkraut...oh my!